Oscar Fingal O’Flahertie Wills Wild, A.K.A. Oscar Wilde – 19th century author. With St. Patrick’s Day only a week away, Irish Scallop Bisque jumped off the page when recently I perused Oana Iancu’s website – Adore Foods. I have the privilege of participating in a “Blog Hop” with over 60 talented food bloggers, and I get to feature a recipe of Oana’s on my blog. While her Irish Scallop Bisque can only be described as luxurious, it really is very simple to prepare. Of course the “star” of this recipe is a perfectly seared scallop, but the bisque itself is full of creamy, savory flavor. A “perfectly seared scallop” may be a challenge for many home cooks. The key to getting a good sear lies in starting with a dry scallop. Unfortunately, most U.S. markets sell “wet” scallops that have been treated with phosphates to preserve shelf life. The phosphates cause the scallops to absorb water, and may give them a bit of an off-taste. If you’ve not made a bisque before, you are in for a treat with this one! A bisque is traditionally a cream and shellfish based soup of French origin. The mirepoix base in this one really bumps up the flavor, and the use of prepared shellfish stock makes this quick and easy. Of course if you have shellfish stock in your freezer, by all means, use it instead. I strongly recommend using an immersion blender to purée the soup. Pouring hot soup into a blender is messy and can be dangerous. My husband and I enjoyed this Irish Scallop Bisque with a whole grain baguette and a bottle of French Pouilly Fuisse on our Friday night date night, and it was fabulous. If you are serving it as a starter course, I would feel comfortable using 1 scallop per bowl as shown in my photo. If you plan to serve it as a main course, I would suggest 2 to 3 scallops per serving. Bon appétit! In a large saucepan, melt 3 tablespoons butter and sauté over medium heat the onion, carrots, celery and potato. Decrease the heat to medium-low and cook for 10 minutes, stirring occasionally. Add dry white wine and continue to cook for another 5 minutes. Stir in tomato paste and cook for another couple of minutes. Slowly add seafood stock, bay leaves and thyme. Cover and gently simmer for 20 minutes. If serving this bisque as a starter course, 1 large scallop per person is plenty. I frequently have seafood stock in my freezer, and I would use it if so. However, commercially prepared seafood stock is now widely available, and quite delicious. Don't use a white wine you wouldn't drink, but don't use something expensive. I substituted 1/2 cup sherry because all I had in the wine rack was an expensive French Pouilly Fuisse. This recipe was adapted from Saveur Magazine, Issue #5. I’m trying this out for Christmas. Just curious if you removed the celery from the soup in the third step? Thanks!! Hi Jennifer! Indeed you do... See step #3 in the instructions. The bisque needs to be super silky, and those fibers would interfere. I hope you love it as much as we do... we're having it Christmas Eve. Merry Christmas! Made this tonight as a trial run for a Christmas Dinner Party that we are hosting next month and it was absolutely fabulous.....so this is definitely going to be our starter course. Yay! I'm so happy you love the recipe, and plan to use it for your dinner party! And I do appreciate you taking time to leave a comment as well... Have a blessed and joyous holiday season Cheryl! This is a great recipe! I love scallops! I guess that's why it's my most popular recipe? Thanks honey! I used half a cup sherry and half cup vermouth. The bisque was delicious. Hi Christine! Half and half is in the dairy section (in the U.S.) - half milk and half cream. You can substitute heavy cream, or even milk, but I find the half and half is about the right amount of richness for the bisque. I'm guessing half and half is a U.S. convention, so I learned something today... Good luck, and let me know how it goes? Thanks for stopping by! Hi Chris, I cook with dried thyme leaves regularly, and have never felt a need to remove them. Unlike bay leaves, they soften, and don't present a problem. The bay leaves (whether dried or fresh) definitely ought to be removed... It is so good! I hope that you will give it a try. :-) Thanks for stopping by! This looks AMAZING! I love scallops!!!! I have to try this! Thanks Victoria! I hope you do :-) I can't wait to make something new with that fabulous chile mesquite bean jelly! This soup sounds incredible and that looks like a perfectly seared scallop on top! Wow! And I did not know the trick to getting a perfect sear out of a wet scallop. Thanks for the tips!! Quite a few people were surprised to know about dry versus wet scallops! It makes my day when my blog provides useful kitchen tips... Thanks Vicky! Hi Whitney! Well, when I serve this as a first course, I do one scallop, and if I serve it as a main course, I do three. Three sea scallops will weigh between 4 and 6 ounces which is an appropriate portion for a main course. Bay scallops are much smaller, and wouldn't work well in this dish... I do hope you'll try scallops; they're favorites in our family! Thanks for your question! I have to be honest, I'm awful with scallops - I'll have to try again though for this amazing bisque, YUM! If you don't like scallops - or have trouble cooking them - try it with crab or shrimp :-) The flavor of the bisque is just lovely! Thanks for stopping by! Wow - this looks and sounds amazing! I love bisque, but have never made my own and I've never had it with scallops - scallops are one of my favorites! Scallops are a favorite here too! If you've not made bisque, you should try this one. It really is easy to make :-) Thanks for stopping by Kathleen! I've not made a bisque before but I sure do love eating them - only ever had a lobster bisque before too! 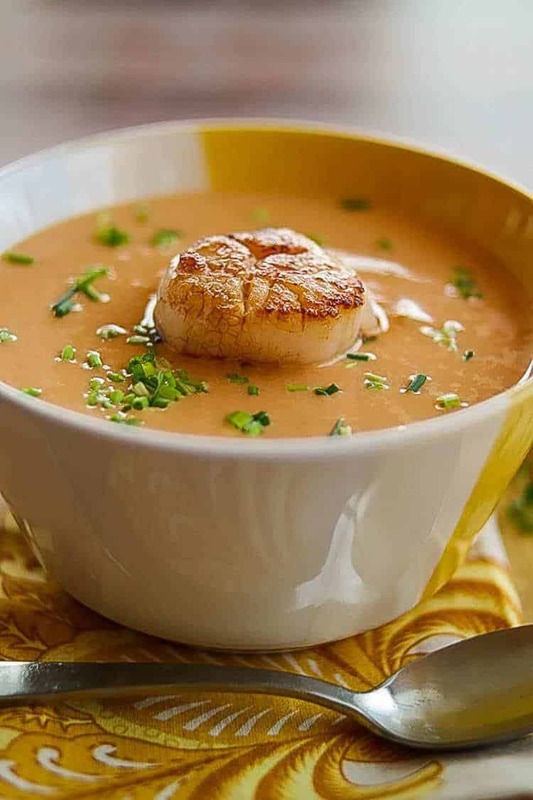 This scallop bisque is a must make recipe for me.. looks SO delicious! Haha! I know how that goes :-) You really ought to come back to it when you can as it really is fabulous. I had fun with the blog hop, and Oana's recipe will be filed away and made again for sure! Thanks for stopping by Kristen! Yay! We loved the recipe, and will make it again! I have to admit being a bit intimidated by your gorgeous photos, and was concerned mine wouldn't do the recipe justice. I think I did okay ;-) We live in New Mexico, so seafood is not reliable. I learned how to deal with it a long time ago. I think a lot of people have trouble with "wet" scallops not knowing why they can't sear them. I'm hoping that will encourage people to try again. Take care Oana!